OLD PARKED CARS. : 1972 Ford Pinto Squire. dang, i spotted this a few weeks ago and couldn't believe it hadn't already snapped it. i would've photographed it, but the creeping rush hour traffic prevented me from standing in the street for a profile shot. also the lighting was bad. so you win. big time. 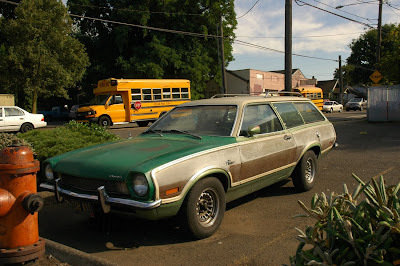 green AND woodgrain AND two-door wagon and what the heck are those rims? 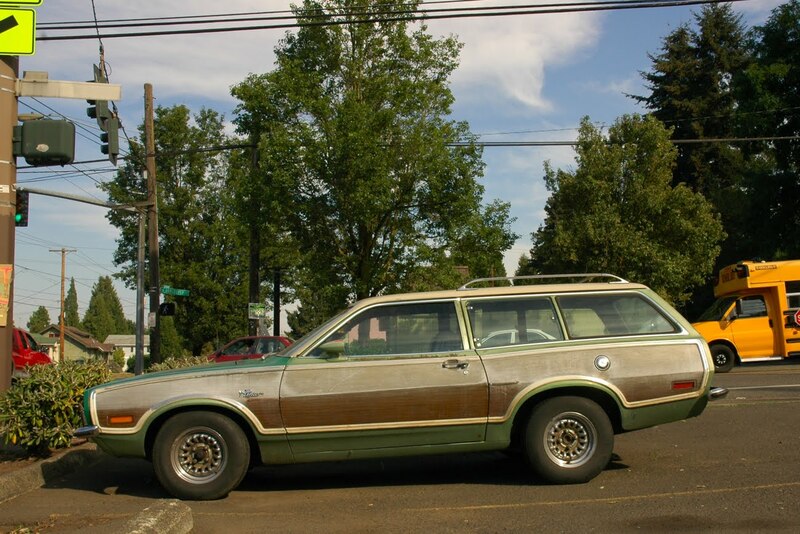 I actually like the way the wagon looks compared to the hatch, fake wood paneling and all. would look great with some slot mags or a set of american racing vectors.the patina looks good on this one. Many years of my youth were spent riding around in one of these, but brown. Geez...Ford put "Squire" on everything. 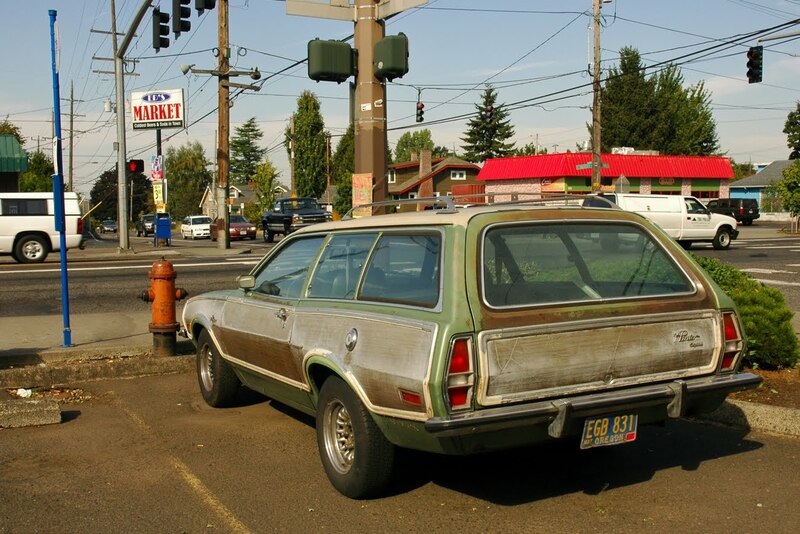 I mean, Country Squire, UK-only Squire, Falcon Squire, Pinto Squire,...did Ford really think that branding their cars with a name that historically meant "(knight) in training" was a good idea? Ford Naming Council: "Um, yeah...so, Squire, cuz it's, like, in training to be a Chevy..."
Whoa! This car gets my vote for the next OPC banner. I don't think I could like an old parked car any more than this, with its muscle-car wheels, faded fake wood paneling, faded Ford 70's green paint (repainted in places), repainted roof, all packaged together in a Pinto wagon. Tonight I will dream of driving this cream puff (although my wife would divorce me instantly if I ever bought something like this). Well done, Ben! This car is wonderful. Photos are great. It needs nothing. If it were to be washed, only the most gentle scrubbing would be sought in order to preserve as much of the delicate patina as possible. 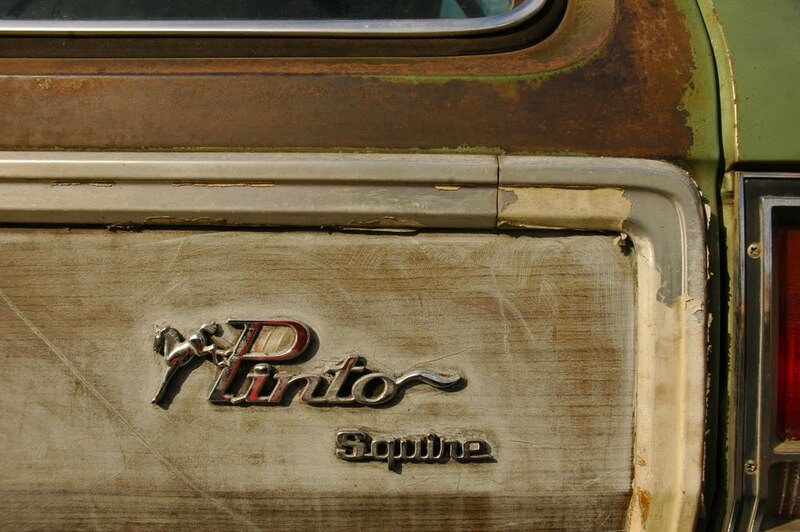 Slotmags would look killer on this Pinto. Although the rims on it now already give off a period correct beater image. Ha, I learned to drive in one of these c0ckbl0ckers! We kept trying to kill it. My mom let it run out of oil and drove it until the engine siezed up. Dad let it cool down, added a few quarts and we drove it for another few years. Then I pulled in front of a Trans Am. I managed to talk the guy out of kicking my @ss but that was it for the Squire. RAD! you guys should have a whole hunting wagon subsection to get in the dandy mood, there was blue one not long ago, also with a scampish nickname like 'nutter' or 'tripper', bobcat 'lil gadabout or some sh*t like that. Pinto owners always know to park near fire hydrants!